Thank you to EatSmart for providing me with product in exchange for my review. All thoughts shared are my own. Throughout my life, I have had terrible body image issues. You might not know this by looking at me, but I struggle with maintaining my goal weight and have for a very long time. As a teen and young adult, I was obsessed with weighing no more than 120 - 125 lbs. I often skipped meals, ate tiny amounts or took other drastic measures to stay thin. Months before my husband and I got married, I became unhealthily thin. With his help and support, I was able to put weight back on and return to a healthy weight. 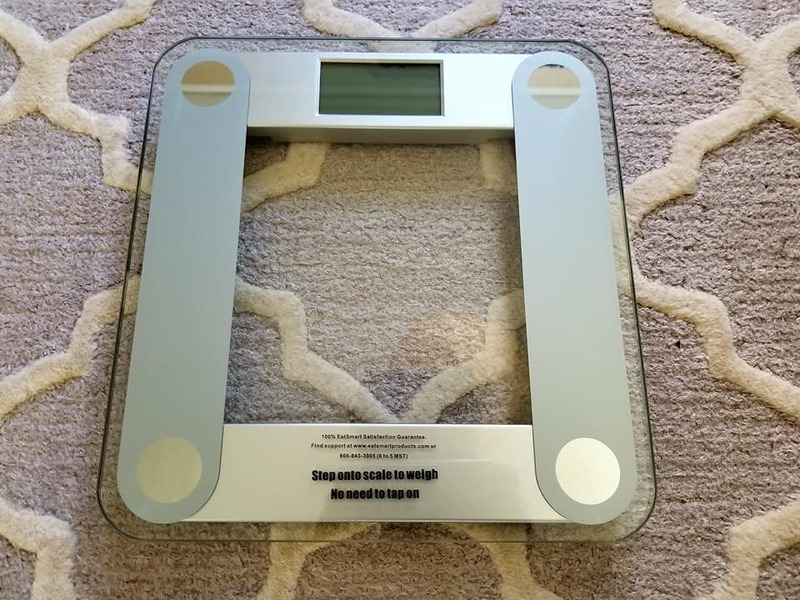 Terrified of becoming obsessed with a number and plunging back into unhealthy habits, I have refused to keep a scale in our home for the almost ten years that we have been married. After having two children, however, I now know what it's like to carry a little extra weight, to be an emotional/stress-eater, and to be unhappy with my mom body. Hubby and I are making strides to be more active and to eat healthier meals. He has a big weight loss goal, and being able to track our progress will actually be a good thing for us. This holiday season, we're staying on track with our health and wellness plan, thanks in part to EatSmart. EatSmart knows that maintaining a healthy, happy lifestyle is a constant challenge. At EatSmart, they want to give you the tools and confidence to meet the challenge head-on. Founded in 2005, EatSmart is devoted to designing, developing and manufacturing innovative healthcare products to meet the needs of their customers. 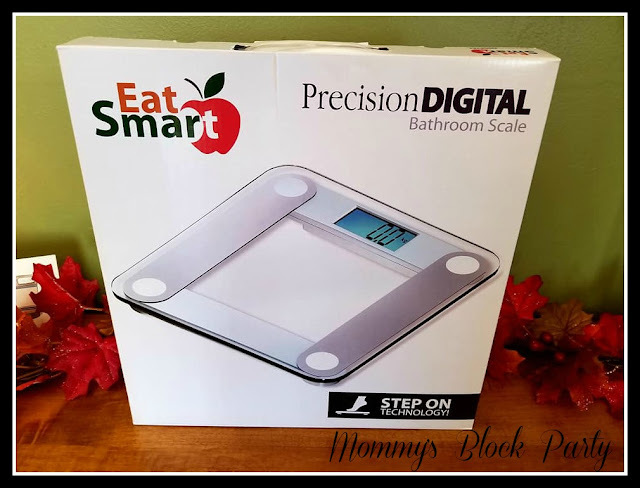 The EatSmart Precision Digital Bathroom Scale is definitely something every family should have at home. Our digital bathroom scale was so nicely packaged. It was well protected by bubble wrap, as well as protected on the sides by foam ends. This is a glass scale, so it's definitely worth protecting well. It was quite easy to set up the scale. 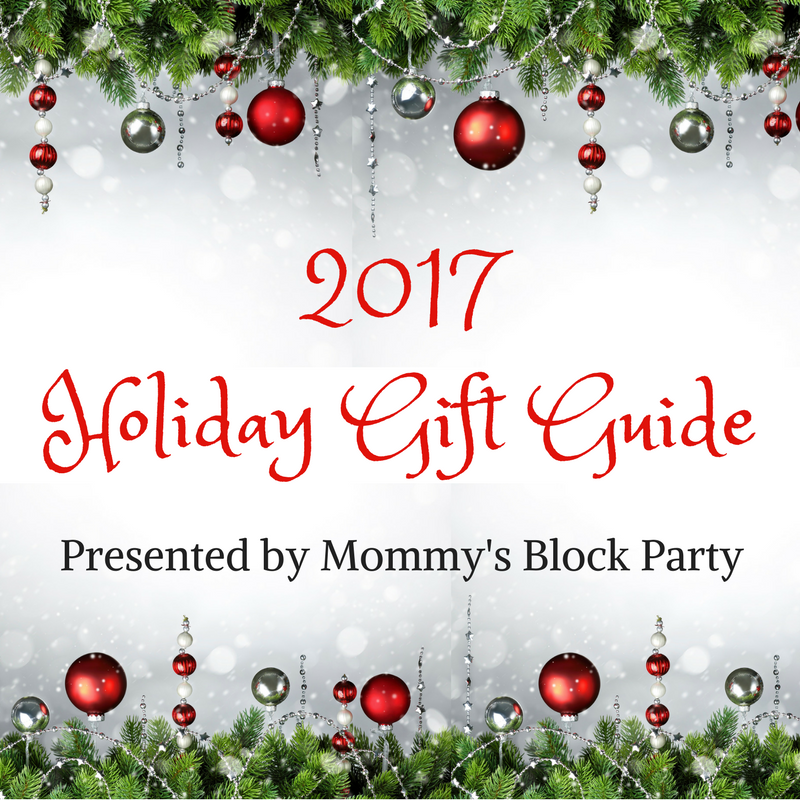 It comes with batteries, so no need to worry about buying those or fishing around for a few extras at home. Just remove the packing materials, pop the batteries into place, and then read the instructions for directions as to how to set up your scale. Using the EatSmart scale for the first time was exciting! Simply step on, and in seconds you'll have an accurate readout to the nearest .2 pounds on the EatSmart's oversized 3.5" Accubright LCD display. With EatSmart's proprietary new "step-on" technology, there is no more tapping to turn the scale on! The LCD display also contains a cool-blue backlight, allowing for easy viewing even in the lowest light areas of the bathroom or home. I was so excited to be able to place our new scale in the bathroom and step on it in the dark, watching the screen light up to quickly give me an accurate reading (which I won't share with you, ha!). Industry Leading Design and Accuracy: The EatSmart Digital Bathroom Scale is also not only easy to use but also extremely accurate, engineered to the highest precision standards. The four high-gauge EatSmart Precision sensors ensure that you will get an accurate measurement every time down to the nearest .2 lbs / .1 kg. Additionally, the slim, tempered glass design fits perfectly into any surroundings and large non-slip platform safely allows weights to 400 lbs. 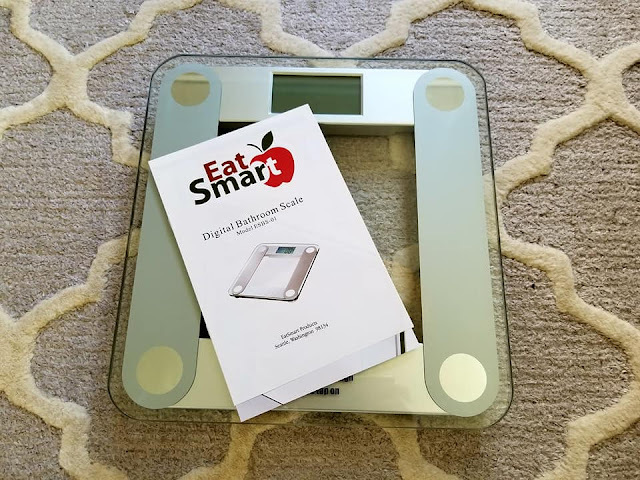 The EatSmart Precision Digital Scale is so sleek! There are a lot of reasons to love this scale. The modern design is incredibly handsome. My husband loves modern design, so this is right up his alley. It's made from very strong glass, which safely holds up to 400 pounds. The kids can step right onto this scale without me having to worry about them damaging it in any way. It isn't clunky, and it ties in beautifully with our bathroom decor. I'm actually so happy to have a scale in our home. No there's no more guessing weights with either of the kids when we have to fill our medical forms, or when we're wondering about sizes for new clothing. Hubby and I can also easily track our weight loss progress every day or every week, whichever we choose to do. There's no tapping and waiting for the scale to come on- just step on and within seconds, you'll have your reading! Updated EatSmart Auto-On Technology and Sensor Accuracy. Best selling scale on Amazon 8 years running. Best in class customer service and support from a trusted vendor! This is the #1 rated bathroom scale on Amazon.com since 2009 with 25,000+ Amazon reviews! How's that for top rated? 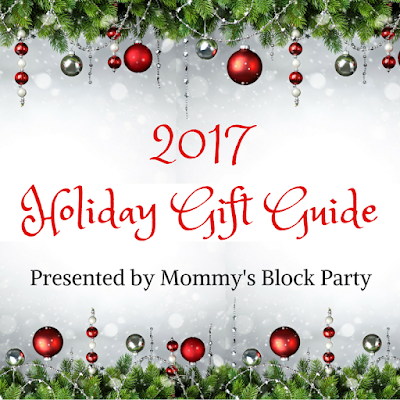 This scale would make a thoughtful gift for anyone who might be looking for a new scale. I know my own parents would love a scale like this- they're in desperate need of a new one. I think the one they have adds 10 lbs per person! No one has to worry about that with the EatSmart Precision Digital Scale! Head on over to EatSmart to check out all of their healthy living products, such as bathroom and kitchen scales. Connect with EatSmart via Facebook, Twitter, Pinterest and IG. One lucky MBP reader will win their own EatSmart Precision Digital Scale! 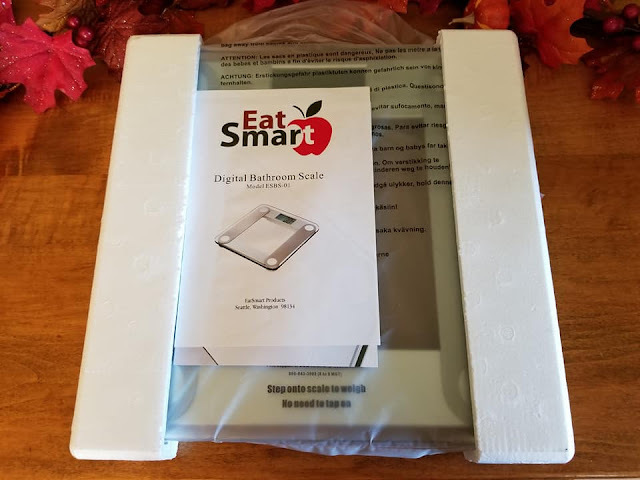 Special thanks to EatSmart for allowing me to share about their fantastic digital bathroom scale and for providing a giveaway for our readers. I am on a weight loss journey and I would love to have an accurate scale that also has large digits that I can see. I would like to win this so I can start weighing myself. I would like to win this scale because mine is old and doesn't work well. I'd love to win because I think this would be a great tool in trying to lose weight. I've lost 15 pounds so far! My old scale is kind of finicky, and it would be great to have a new one! I don't have a scale and I am working to lose weight. 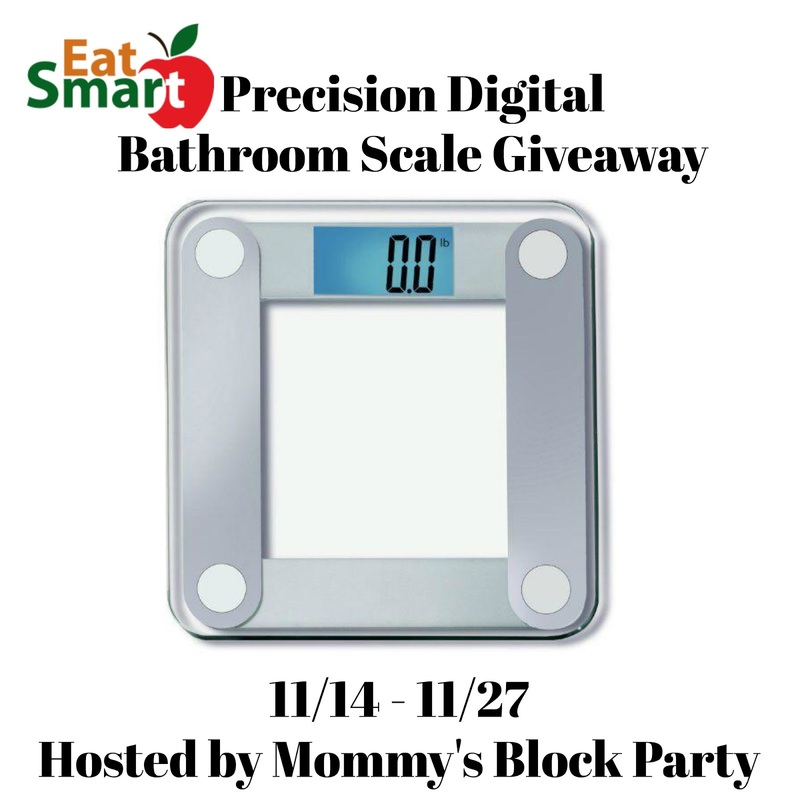 I'd like to won because our scale broke about a year ago and I haven't replaced yet. Also, I love that this scale has a non-slip platform. We have one similar to this but it stopped working. I would love to win this because I do not have one and Im pregnant :). The scale I had got dropped and it broke. I think having a scale helps motivate you in your daily life to want to eat healthy and stay fit. I have started to drink more water and I am trying to walk a little more each day my daughter calls it adventures since we go a little further everyday. I would love to gift the scale to my sister for her upcoming birthday! To try to stay healthy, I take a lot of vitamins daily and eat plenty of veggies & fruit! I try to keep myself healthy by eating right, drinking lots of water and exercising often. I always try to keep a positive attitude! I try to stay healthy by washing y hands often and efficiently. To stay healthy, I always use hand sanitizer on grocery store & retail store carts that I use. I would like the scale to start the new year on a healthy note. I need to start exercising more and eating better. I try to walk at least 10,000 steps each day.